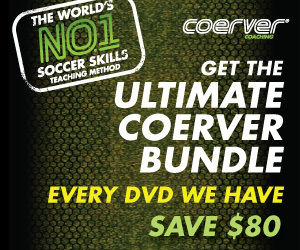 Coerver Coaching recently teamed up with the BBC's Match of the Day magazine for Train Like a Pro. If you want to play professional soccer then this is the magazine to read and to follow. Below are four soccer drills to help you get your players ready to play at the highest level. Coerver Coaching's methods are used by the likes of Manchester United, Arsenal and Real Madrid — so BBC's Match of the Day teamed up with Coerver to design a special program to help sharpen your skills in time for the new season! In this article you get four essential drills that will help you coach the qualities of the world's greatest players. Manchester City's David Silva is an expert when it comes to keeping the ball under control at high speed and then delivering a killer pass or a finish — this drill teaches you how to do the same! A Mark out a square 25 yards wide on each side and place a ball in the middle! B Dribble round the square, keeping the ball under close control at all times! C After one lap, shoot or pass, trying to hit the ball in the middle! Top tip: Focus on accuracy rather than power for your final shot or pass! Killing the ball dead with his first touch gives Barcelona's Lionel Messi more time to decide what to do next — it’s one of football’s most important skills, and here’s how you can pull it off! A Stand 25 yards away from your teammate who has the ball! B Run towards him and call for him to pass the ball! C Take a touch to control it, turn and pass to your teammate behind you! Top tip: Use both the inside and outside of your foot to turn with the ball! Real Madrid's Xabi Alonso’s first-time shooting is immense — that’s because he hits the ball on the sweet-spot in the center of the ball to generate power and accuracy — here’s how you can do it! A Pass to your teammate in the yellow square, who dribbles to the orange square! B He steps on the ball to stop it for the waiting player, who hits a shot on goal! C Keep going for ten minutes — try to score as many as you can! Top tip: Keep your knee over the ball as you strike to stop it flying over the goal! Liverpool's Steven Gerrard drives through the ball like a golfer hitting a tee shot! It’s the perfect way to move the ball quickly over long distances. Here’s our drill to sharpen your skill! A Stand diagonally opposite your teammate, around 20-25 yards apart! B Touch the ball out of your feet and play a pass to your teammate! C Aim for your teammate ’s feet — he shouldn’t have to move to control it! Top tip: Try using different parts of your foot FOR EXTRA lift, curl and precision! 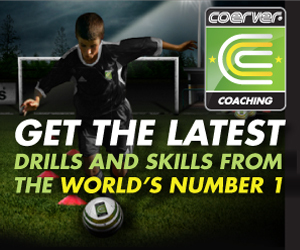 Learn more about Coerver Coaching.